Pareidolia: The way in which the brain tries to organize meaningless stimulus into something that is recognizable. The Face on Mars, the Man in the Moon, Jesus Christ in a cinnamon bun and so forth. For years I saw faces in my bathroom wallpaper. 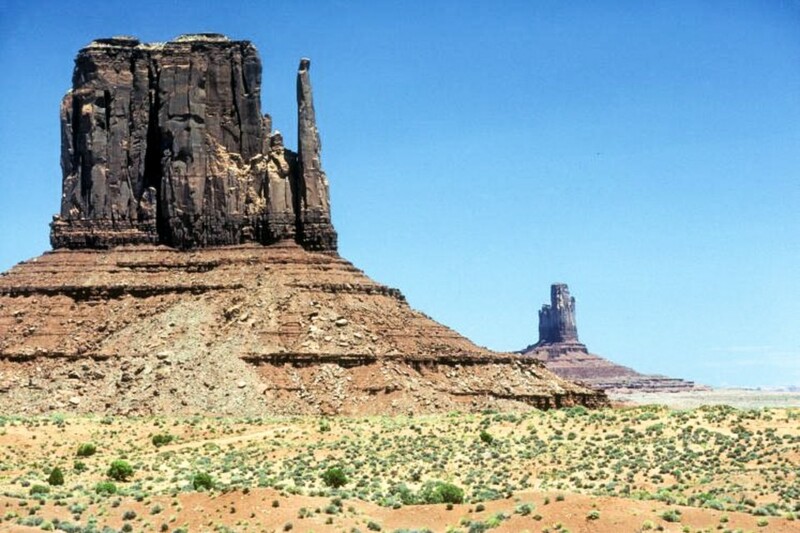 So it is with this “Mitten” in Monument Valley. “Sacred Monoliths” was taken on July 10, 1981. I have probably looked at this image a hundred times and I still see women and children in the rock face. Keep looking. Many years ago I traveled through the Southwest from Colorado through the Four Corners area, into Utah, New Mexico and Arizona. I was struck first with the beauty of these red sandstone cliffs which seemed to pop up everywhere as we entered southwestern Colorado. As I looked closer I noticed this black coating on the sandstone and I was told that this was magnetite. Then I began to “see things” in the cliffs that had been eroded as a result of time and wind and water. The clouds too seemed different. Living in the East for all of my life I had rarely seen such puffy white clouds. I clearly understood why this area was sacred to the Navajo, Hopi, Apache and many smaller tribes. I didn’t need to smoke peyote to have a vision. Moving into Monument Valley was almost a religious experience. It was a place that I had only seen on calenders and now I was actually there. There were people and birds and all sorts of things visible in the cliff faces. You did not need to be told to look for them because there were clearly visible. Excellent examples of what is know as pareidolia. The land is equally magnificent and unforgiving. Experiencing it through the medium of an air conditioned vehicle is one thing. Actually surviving there is quite another.